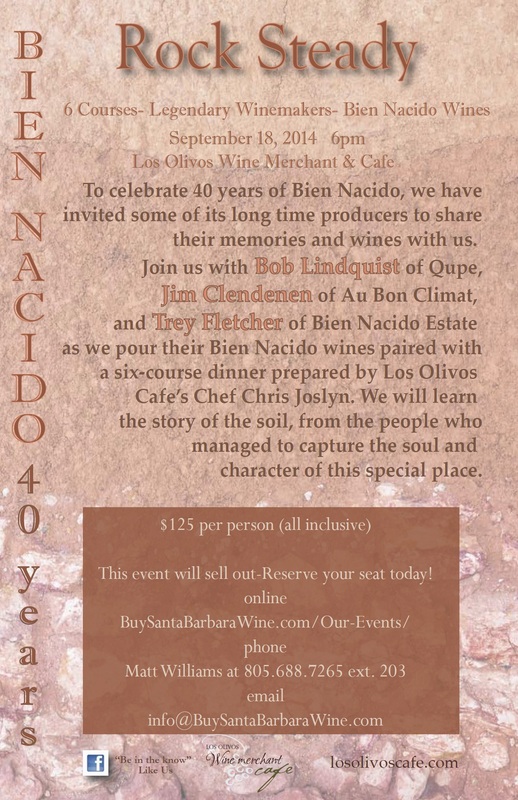 On Thursday September 18th, we’ll be hosting a dinner here at the Café featuring Bob Lindquist of Qupe, Jim Clendenen of Au Bon Climat, and Trey Fletcher of Bien Nacido Estate to celebrate 40 years of Bien Nacido Vineyard. It’s very rare to get this legendary brain trust in one place to share their stories, so it should be a pretty magical evening. Leading up to the dinner, I’ve been reflecting about what makes Bien Nacido so distinctive, and, in a larger sense, the things that make a vineyard special beyond the usual talk of soil and climate. Beginning in 2008, I had the privilege of working at Bien Nacido for 2 ½ years as a cellar rat for Tantara, whose winery was located on the property. From our location in the central flats of the property, I could see our neighbors Ambullneo down the road (Dieter Cronje and Matt Murphy, who would go on to create the formidable Presqu’ile property, were part of the cellar team there at the time), and ABC and Qupe’s massive cellar across the river. Driving into work each morning, checking out the various blocks was a visual roll call of the who’s-who in Santa Barbara County winemaking: that slope is Foxen’s Block 8; that little wedge of Syrah belongs to Paul Lato; there’s Manfred from Sine Qua Non checking on his fruit. And of course, there were the legendary parcels made famous by the likes of Au Bon Climat, Qupe, and Lane Tanner, each its own piece of history with a story to tell. Great vineyards have a certain energy to them, a soul if you will, and Bien Nacido is one of the most soulful sites I’ve had the opportunity to spend time in. Where does this presence of place come from? I don’t think it’s something that can be separated from the human element. All of the factors that have come together in Bien Nacido- the passion of the Miller family, who founded the property and own it still; the fervent passion of Jim Clendenen, who spread the gospel of Bien Nacido throughout the world; the brilliant modern stewardship of vineyard manager Chris Hammell- have given form and voice to the natural elements of this piece of land in a way that is singular and special. A site whose natural factors suggest something merely good cannot be willed into greatness; by the same token, a site with the seeds of greatness can’t realize its potential without the vision of human beings like those mentioned above. In this way, wine may be the ultimate expression of the union between Mother Nature and Man. If I were to use one word to describe the character of Bien Nacido Vineyard, it would be verve. Whether it is a late-picked, luscious Syrah, a spice-driven, lithe Pinot Noir, or a mineral, lean Melon, there is a brightness and vivaciousness that gives lift and precision to wines from this site. The cool climate of the Santa Maria Bench, coupled with calcium-rich shale soils, is a large part of the reason for this, though again, the personalities behind the wines are a huge factor. When one observes the passion and attention to detail given by Justin Willett of Tyler and Lieu Dit, or the acuity of Trey Fletcher for Bien Nacido’s estate program, it’s no surprise that this lively, precise quality can be tasted across the varietal spectrum. There is a story in the soil, a voice waiting to be broadcast that will shout to the world the character of a great site. Bien Nacido is such a site, with translators who have managed to magnify and capture its unique personality. I look forward to hearing from Jim Clendenen, Trey Fletcher, and Bob Lindquist as they delve deeper into the story of Bien Nacido; no matter how much you think you know about a familiar place, there is also a new layer to be uncovered.